OSAMA BIN LADEN IS DEAD; President Tells Nation 'Justice Has Been Done' : The Two-Way The man responsible for the Sept. 11, 2001, terrorist attacks on the United States was killed in Pakistan by U.S. forces, President Obama says. Osama bin Laden, who created the al-Qaida terrorist network that killed 3,000 people in the Sept. 11, 2001 terrorist attacks on the United States, is dead. 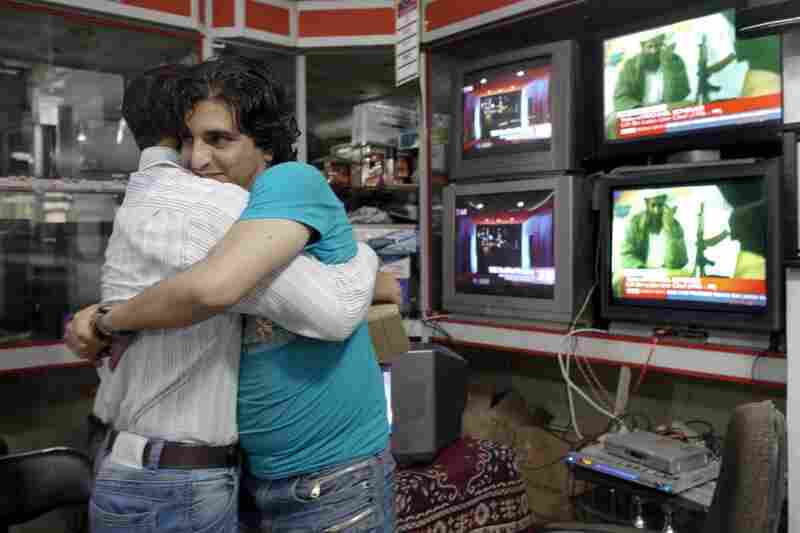 He was killed, President Obama announced to the nation late Sunday night, in Pakistan by U.S. forces. No American personnel were injured during a firefight with bin Laden and his guards, which the president said happened earlier in the day. With the al-Qaida leader's death, a new and dramatic moment has occurred in a long struggle that has seen the U.S. go to war first in Afghanistan — where al-Qaida was based — and then in Iraq. We will keep updating this post as the story develops. Update at 1:19 p.m. ET, May 2; An Islamic Burial. A government official told reporters that the body of Osama Bin Laden was buried at sea from the deck of the USS Carl Vinson, an aircraft carrier, in the north Arabian Sea. The official said the body was washed in accordance to Islamic practices and a religious verse was read and translated into Arabic. The body was placed on a flat board and tipped. Update at 11:02 a.m. ET, May 2; DNA Proves Its Bin Laden. The AP reports that two Obama administration officials say "DNA evidence has proven that Osama bin Laden is dead, with 99.9 percent confidence." The AP adds that the officials did not say where or how the testing was done. Update at 7:15 a.m. ET, May 2. A Quick Recap. -- Around 10 p.m. ET last evening, White House reporters were told that the president would be making an important announcement, related to national security. -- Between then and around 11 p.m. ET, word started to leak that U.S. forces had killed Osama bin Laden. -- Just after 11:30 p.m. 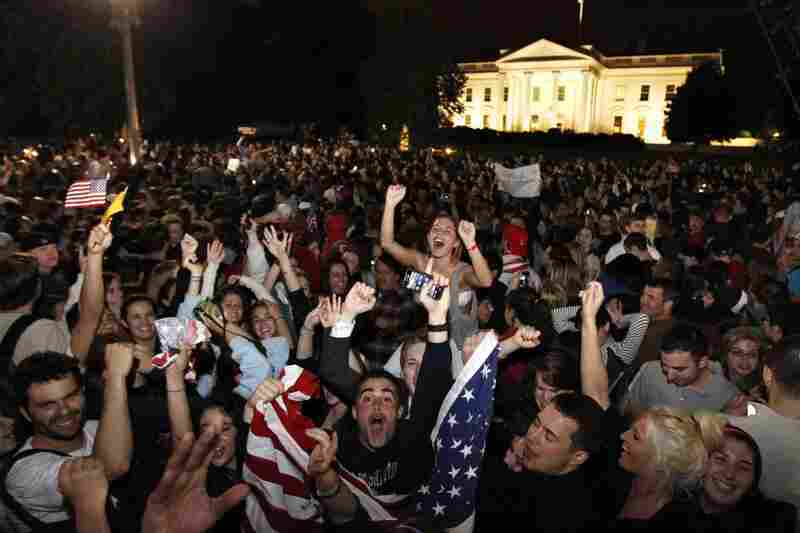 ET, President Obama delivered the news to the nation. Bin Laden had been killed earlier in the day, the president said. A small American strike force descended on a compound in Abbottabad, Pakistan, just north of Islamabad. After about 40 minutes on the ground, and a firefight, they left with the al-Qaida leader's body. Three other men, and a woman who U.S. authorities say was being used as a human shield, were killed. -- Since then, we've heard some more details about the raid, the intelligence that led to it and have been told by several news outlets that bin Laden's body, after DNA samples were taken, has already been buried at sea. "The success of the raid marks a psychological triumph in a long struggle that began with the 2001 attacks, and seems certain to give Obama a political lift. But its ultimate impact on al-Qaida is less clear. The greatest terrorist threat to the West is now considered to be the al-Qaida franchise in Yemen, far from al-Qaida's core in Pakistan. The Yemen branch almost took down a U.S.-bound airliner on Christmas 2009 and nearly detonated explosives aboard two U.S. cargo planes last fall. Those operations were carried out without any direct involvement from bin Laden." Scroll through and see how the story has developed and to watch the video of President Obama delivering the news. And throughout the day, NPR.org and The Two-Way will be following developments. 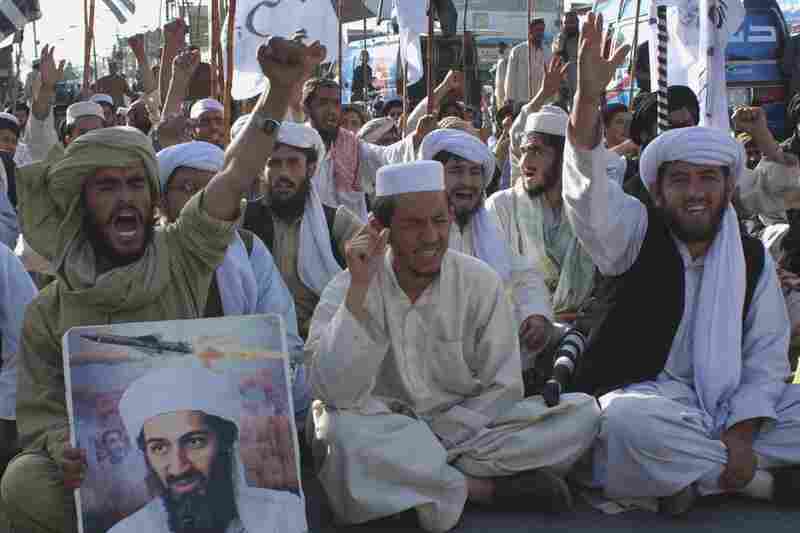 "Within hours of bin Laden's death," The Associated Press reports, "members of groups affiliated with the al-Qaida-linked Haqqani network in Pakistan were already promising that the day-to-day mission on the ground would not change." Update at 5:25 a.m. ET, May 2. He Was Living In An Area Known As A Summer Retreat: Abbottabad, the place where bin Laden was found, is "a military cantonment and summer retreat" known for its "mild temperatures and picturesque views of the surrounding Sarban hills," The Washington Post reports. The Associated Press, like CNN and The New York Times, is reporting it has been told by a senior U.S. official that bin Laden's body has already been buried at sea. The AP writes that "finding a country willing to accept the remains of the world's most wanted terrorist would have been difficult, the official said. 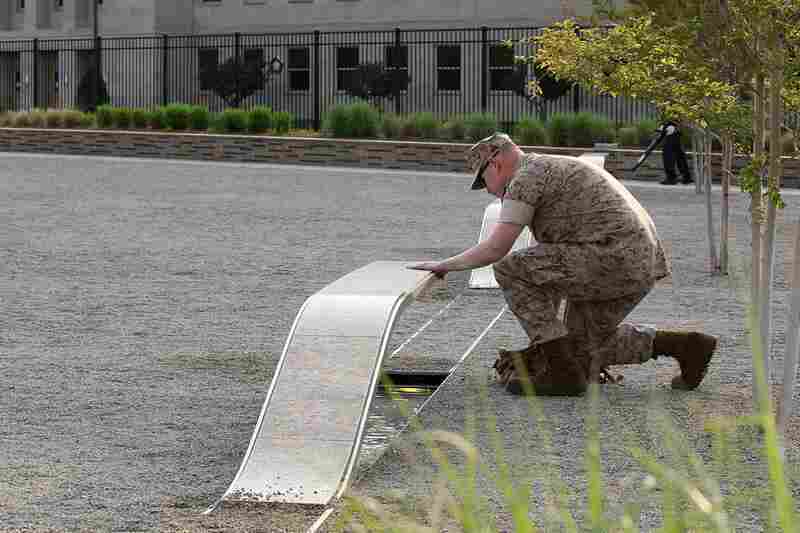 So the U.S. decided to bury him at sea." Bin Laden grew up in Saudi Arabia. "Helicopters descended out of darkness on the most important counterterrorism mission in U.S. history," the latest NPR.org story begins. "It was an operation so secret, only a select few U.S. officials knew what was about to happen." Update at 4:50 a.m. ET, May 2. 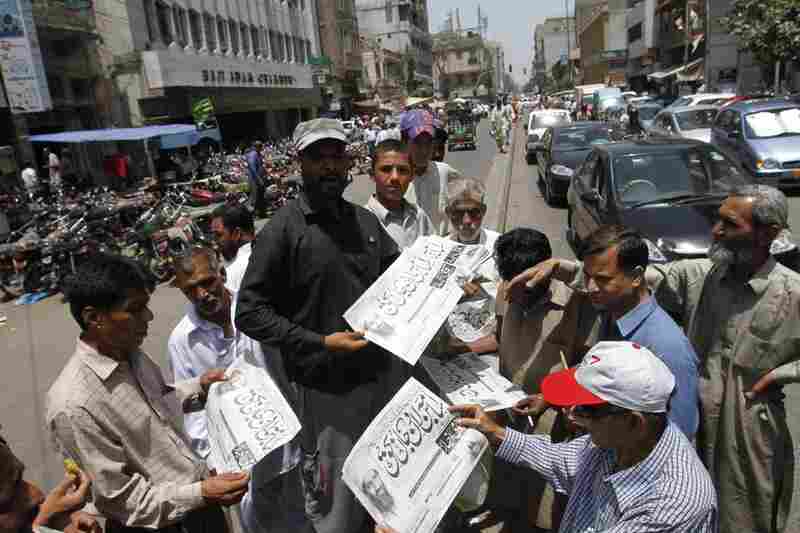 In Pakistan, Question Will Arise — Was Bin Laden Hiding In Plain Sight? The compound where bin Laden was found is very near a Pakistani military training and recruitment center, NPR's Julie McCarthy reports, and that will only add to questions about how much some in that country's intelligence agency and military knew regarding his whereabouts. Pakistan also two problems, she told Morning Edition's Steve Inskeep — bin Laden's presence in the country reinforces its global image as the nexus of terror, and the U.S. raid will likely anger many Pakistanis who will see it as a violation of national sovereignty. Looking at al-Qaida after bin Laden, The Washington Post writes that the terrorist network "has metastasized in the decade since the Sept. 11, 2001, attacks, expanding its reach and adapting its tactics in ways that make the organization likely to remain the most significant security threat to the United States despite its leader's demise." In some places, as the Post says, al-Qaida is a "force multiplier ... lending expertise and inspiration to groups increasingly capable of wreaking devastation on their own." While the operation to find bin Laden ended with "an intense firefight," this was "more than a military operation, it was an intelligence operation," NPR's Tom Gjelten just said during our special live coverage of the news. Human intelligence ended up being critical, he said, as the U.S. tracked bin Laden down by following one of his trusted couriers. NPR's is now streaming its coverage of the story. Click here if you want to listen. Echoing what CNN reported earlier, the Times is saying that after taking bin Laden's body to Afghanistan, perhaps for tests to confirm his identity, the U.S. then flew the al-Qaida leaders remains out to sea and disposed of them. NPR's Tom Bowman reports that after learning last summer that bin Laden might be in the compound north of Islamabad, the U.S. employed all its intelligence assets to determine if that information was true. "They used the National Security Agency, which is the eavesdropping agency," he says, "picking up any information they could. [And] they worked detainees being held in U.S. custody who had information about couriers bin Laden had been using." And, as we reported earlier, information about the couriers played an important role in tracking down bin Laden. "In the end, some of these couriers — unwittingly — may have been bin Laden's undoing," Tom says. Presumably after doing tests to confirm his identity and to preserve evidence to prove his death, American personnel have already disposed of bin Laden's body at sea, CNN's Jeanne Meserve just reported, citing intelligence officials with knowledge of the action. 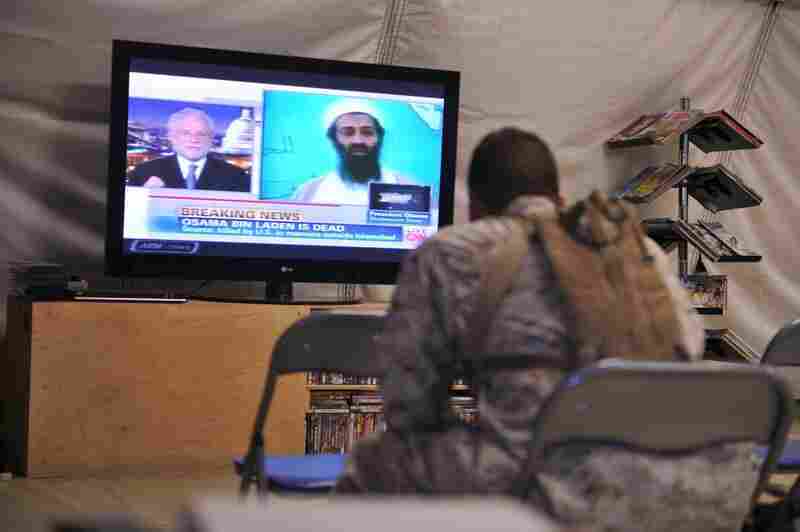 CNN says it has been told that bin Laden, 54, was shot in the head during firefight at his compound. "I heard a thundering sound, followed by heavy firing. Then firing suddenly stopped. Then more thundering, then a big blast," Mohammad Haroon Rasheed, a witness who was nearby when bin Laden's compound was raided, tells The Associated Press. "In the morning when we went out to see what happened, some helicopter wreckage was lying in an open field." As we reported earlier, U.S. officials say one American helicopter was destroyed by the U.S. personnel after it encountered some type of problem. While senior Obama administration officials told reporters tonight that Pakistan was not informed about the raid until after it was over, Pakistan's The Dawn media group says it has been told by a Pakistani security official that it was "a joint operation" between U.S. and Pakistani personnel. In his statement, President Obama said that "our counterterrorism cooperation with Pakistanhelped lead us to bin Laden." Still, the senior Obama administration officials told reporters that the U.S. team that conducted the operation "did not encounter any local authorities while performing the raid." Update at 2:10 a.m. ET, May 2. Video Of The President's Statement. 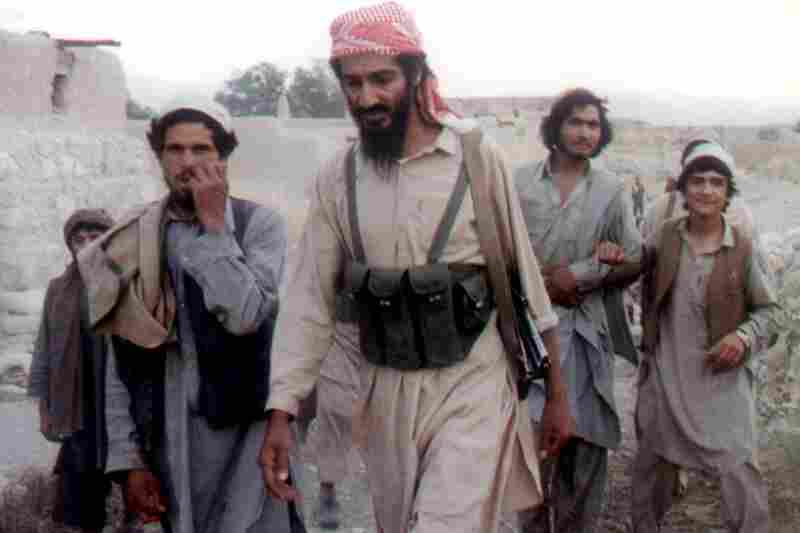 The New York Times headlines its bin Laden obituary "The Most Wanted Face Of Terrorism." The State Department has put U.S. embassies "on alert and warned of the heightened possibility for anti-American violence," The Associated Press writes. "In a worldwide travel alert, the department said there was an 'enhanced potential for anti-American violence given recent counterterrorism activity in Pakistan.' "
The State Department statement is here. There's now an NPR story about bin Laden's life, which as Mary Louise Kelly writes "ran a fascinating trajectory: from the pampered son of a Saudi millionaire to the world's most-wanted terrorist." According to senior administration officials who spoke to reporters earlier, the U.S. was led to the compound where bin Laden was hiding in part because of intelligence gathered from suspected terrorists who are among the detainees that American personnel have been questioning in the years since the 9/11 attacks. Those detainees, the officials said, provided information on the couriers who had been helping bin Laden communicate with others in al-Qaida. And that information led U.S. personnel to start tracking two couriers and eventually to the compound in Pakistan. Senior administration officials told reporters earlier this evening that the compound where bin Laden had been living is about five years old and appeared to have been designed to hide someone of significance. It had high walls topped with barbed wire. Access was through two guarded gates. There were few windows. Though the property was valued at about $1 million, there were no telephone or Internet connections. But officials said they do not know how long bin Laden had been there before intelligence led them to start studying the compound last August. "I hope his death was slow and painful and he was conscious and suffered," said Alyson Low, who lost her sister, Sara, that day. Sara, 28, was a flight attendant on Flight 11 out of Logan Airport and fought the terrorists right up to the moment she died in the Twin Tower national tragedy, according to court documents recently made public. 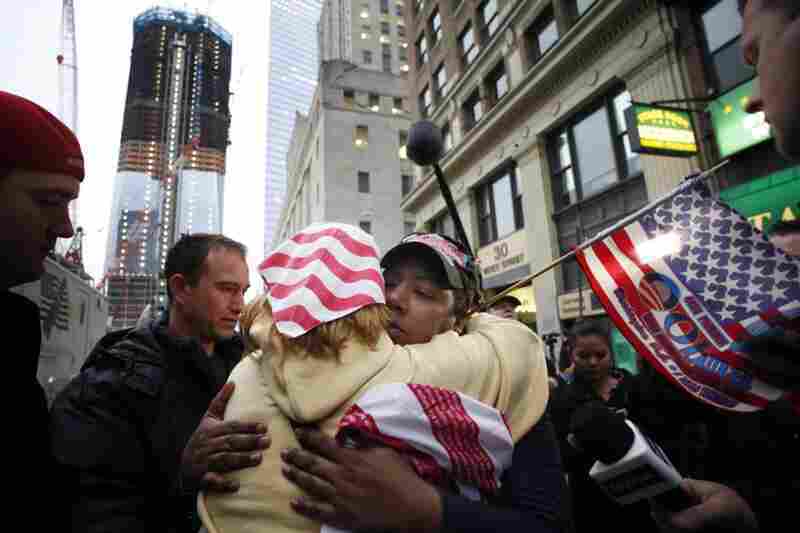 "Hundreds of people were gathering in New York City at the World Trade Center site, where the twin towers fell on Sept. 11 nearly 10 years ago, hours after President Barack Obama announced that Osama bin Laden was killed," The Associated Press reports. 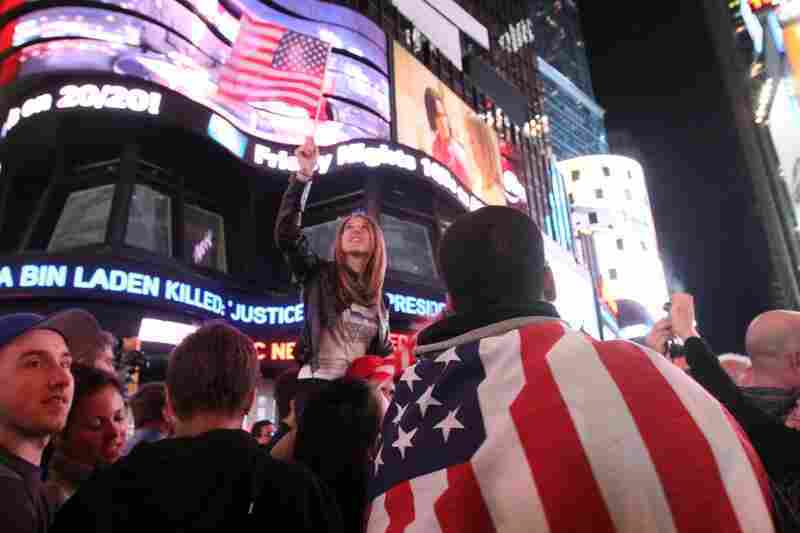 "Many were waving American flags or taking pictures early Monday. The group broke into spontaneous, jubilant cheers and song, including a rendition of I'm Proud to be an American." The compound where bin Laden was hiding and where he died is located about 35 miles from Islamabad, Pakistan, senior administration officials told reporters a short time ago. And they said the president gave the go-ahead for the mission on Friday morning. Update at 12:45 a.m. ET, May 2. Text Of The President's Statement. Here is the White House transcript of the president's address. Click the title to enlarge the text. According to senior administration officials briefing reporters, bin Laden did "resist the assault force" during the firefight that led to his death. They've also told reporters that no other nation was told in advance of the raid. Senior administration officials are briefing reporters now on some of the operation's details. They say that along with bin Laden, three adult males and one women were killed. The woman, they say, was being used as a shield by one of the men. The operation, they say, was a "surgical" raid carried out by a small team that flew to the site on helicopters. One helicopter, they say, had problems and was destroyed at the site by the U.S. personnel — who then flew out aboard the other helicopter. The cable news networks' live coverage from the scene shows more and more people — many of them college students from nearby universities — gathered outside the White House. There's much cheering, singing and waving of flags. "Earlier this evening, President Obama called to inform me that American forces killed Osama bin Laden, the leader of the al-Qaida network that attacked America on September 11, 2001," former President George W. Bush says in a statement his office just released. "I congratulated him and the men and women of our military and intelligence communities who devoted their lives to this mission. They have our everlasting gratitude. This is a "momentous achievement," former President George W. Bush says. As he wraps up his remarks, the president asks that the nation "think back to the sense of unity" that prevailed after the 9/11 attacks. That was a testament to the nation's greatness, he says. Tonight, says the president, "we can say to those families who have lost loved ones ... justice has been done." Last August, the president says, the U.S. got a lead on bin Laden's whereabouts "within a compound deep inside Pakistan." "Last week," he says, "I determined we had enough intelligence to take action." 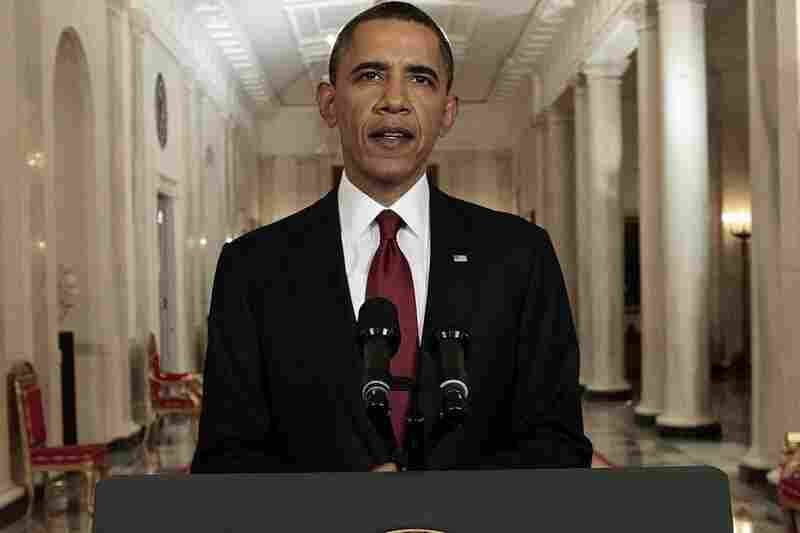 "Today, at my direction, the United States launched a targeted action" and in a firefight killed the al-Qaida leader. The U.S. now has his body. 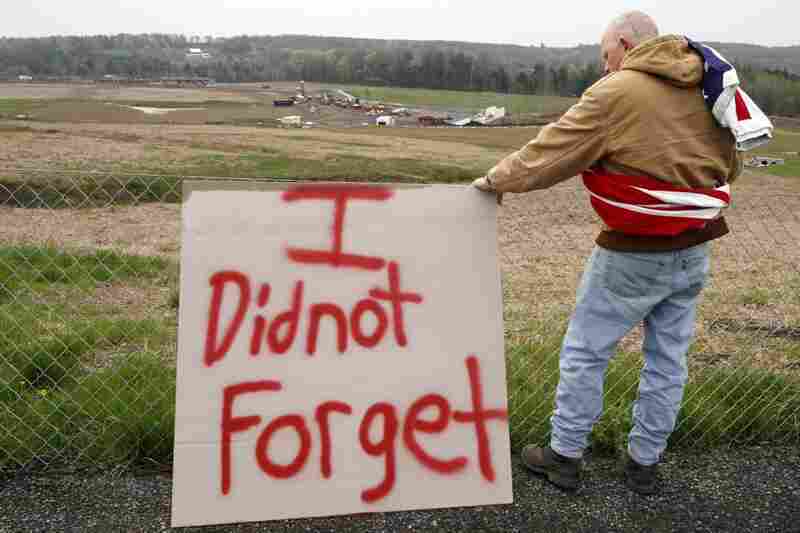 Looking back at the horrors of Sept. 11, 2001, the president says that as terrifying as they were, even worse scenes came later and weren't seen around the world. They were the "empty seat at the dinner table" and the children who grew up without parents. Update at 11:38 p.m. ET. Obama Confirms The News. A crowd is outside the gates and can be heard singing the national anthem and chanting "USA!" "A senior U.S. counterterrorism official said bin Laden was killed in a ground operation in Pakistan, not by a Predator drone," The Associated Press reports. "The official said it happened last week."